If you want to add or edit employees en masse, you can do so using the Import/Export feature on the Management Console. Please Note: The employee import/export feature currently only works with Excel. On the Management Console ([yoursubdomain].revelup.com), go to the Employees tab. Advanced: This export will contain your current employee list. It will have all basic employee detail columns (name, email, role, hire date, active status, etc.) and additional detail columns (image URL, external id, and mileage reimbursement). Use this export type if you want to add new employees and/or edit existing employees. Basic: This export will contain your currently employee list. It will only contain the most basic employee detail columns. 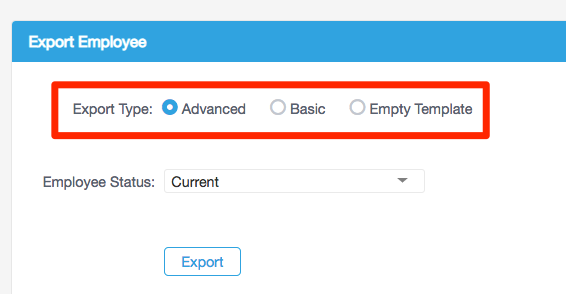 Use this export type if you want to add new employees and/or edit existing employees. Current: Only your active employees will appear on the exported sheet. Former: Only your employees whose Employee End dates have passed appear on the exported sheet. Unassigned: Only your active employees who are not currently attached to an establishment will appear on the exported sheet. Inactive: Only your inactive employees will appear on the exported sheet. Finally, click Export. Your Excel file will download to your computer. ID: The arbitrary ID number assigned by Revel. Leave this field blank for each new employee. Email: This must be filled out with a working email address if you want to send schedules through the Management Console. Establishments: Enter all establishments where the employee will have access. Remove from Establishments: Enter all establishments where the employee previously had access, but no longer will. Role: The active role of the employee. Role Wage: The hourly wage the employee earns when clocked in as the role in column H.
Role Active: Enter Yes if the employee should remain active in this role. Enter No if the employee is no longer active in that role. Pin: The unique number the employee uses to clockin/out and login to the Point of Sale. Employee Start: The date the employee gained access to the system. Employee End: The last day the employee had access to the system. If there is no known end date, leave this field blank. Employee Card: If the employee has a card to access the Point of Sale, enter the card ID here. Image URL: The website link of the employee's photo. Exempt: Enter Yes if the employee receives salary pay instead of an hourly wage. If the employee does receive an hourly wage, enter No or leave this field empty. External ID: If you integrate with a third party payroll system, enter their ID here. Internal Employee ID: This is an optional field for any other employee ID numbers used. Mileage Reimbursement: If the employee receives reimbursement per miles driven, enter the amount here. Once you've added new employees and/or updated the details of existing employees, save the Excel file. On the Management Console, go to the Employees tab. Click the icon and click Export/Import Employees. Scroll down to the Import Employees section. Click Choose File and attach your saved Excel file. The import is an offline process. You'll receive an email with the results of the import. If any errors occurred, fix them in the Excel file and repeat the above import steps.